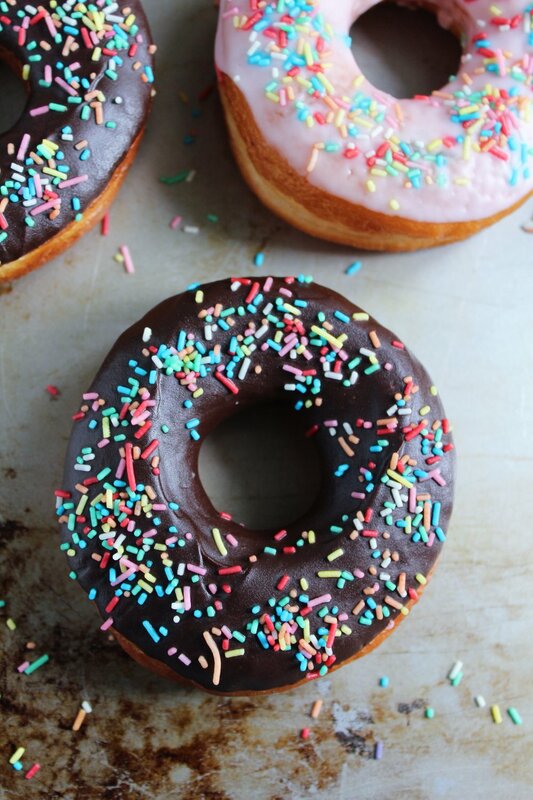 This month my blog turns two - and what better way to celebrate than with doughnuts and sprinkles? When I started my blog I was working full time, my boyfriend and I had just moved into our first home and, honestly, I wasn’t sure how long I’d keep it up. But over the past two years - which have seen me quit two jobs (and have many nervous breakdowns about ‘where I am’ and ‘what I’m doing’), it’s turned out to be the most consistent, comforting and creative outlet for me during a time when (career-wise) everything else seemed to be up in the air, or spiralling out of control. Sometimes I have to remind myself why I started to blog. Of course, I wanted to be able to share recipes, ideas and inspiration with other people but, mostly, I was looking for a creative project to focus on... Something to escape to in my spare time and forget about the stress of work. It was a way to hold on to my creative side, and ensure that I didn’t let it fall by the way side. I was working in an office to earn money, but my true passion was in my baking - and I guess without the blog, I was worried that I’d start to lose that passion and get too caught up in a mind-set of living for the weekend. Now 2 years on - I guess it worked. I’m more focused than ever, and determined to make this work for me. Besides, I don’t think my family can cope with me moaning about being unhappy in another job. This year marks a fresh start in more ways than one. Along with my blog, I’ve also launched a new menu on my website for my custom cakes, which I’m really excited about. Pre blogging days, I started Hannah Bakes (in 2013) making cupcakes and layer cakes to order, selling them locally and at food festivals. Although at times it can be massively stressful and demanding (crying on the kitchen floor is not unheard of in this house), I finally decided it was time to merge this with my blog - and I’m so happy to finally be doing both at the same time. I’m really looking forward to seeing what the next 12 months have in store. I know there’s one baking project on the horizon that I’m already the MOST proud of because, on top of everything else, my boyfriend Callum and I will become parents for the first time in the summer - what are we doing?! Aside from sheer panic, we are so very excited to be building a little family together. ...And on THAT revelation, I’m going to wrap up this rather chatty blog post and let you get to those doughnuts that I lured you in with (what clickbait?). If you’ve made it this far, then a huge thank you for reading my blog and supporting me - every single like, comment or share truly makes me so happy. Now, let's all eat doughnuts! Once melted, pour the glaze onto a small side plate and dip 6 doughnut rings into the glaze to coat the top of each, then finish with sprinkles!